A little while back I wrote about how to maximize the AIR MILES program which is a very popular loyalty program in Canada. However, I admitted in the article that I’m more of a passive AIR MILES collector where I generally prefer cash back as a reward because it can’t be diluted or expire. Although I prefer pure cash back, there is a loyalty program that we follow that is a hybrid of a cash back and points program, and that is the Loblaws/Shoppers Drug Mart (SDM) PC Plus program. The PC points program is essentially a cash back program however the points can only be redeemed for purchases at the Loblaws group of companies such as Loblaws, Real Canadian Super Store, No Frills, Dominion (in NL), and soon Shoppers Drug Mart (Feb 2018). I include SDM in this because Loblaws owns SDM and will be combining the SDM Optimum program and the PC points programs together. Soon you’ll be able to redeem PC points at SDM stores. The PC Plus program is an enhancement to the PC points program. When you sign up for the PC Plus program (it’s free), you’ll get a weekly email with specialized offers based on your shopping habits. Personally, I like to use the free phone app which shows your points balance and all your weekly offers in a nice and organized manner. For example, this week, one offer was for 200 pts for every $1 spent on potatoes. Since 20,000 pts = $20, the offer equates to 20% off potatoes. Another offer was 1,000 pts for every $5 spent on Joe Fresh apparel which is also a 20% discount. What does Loblaws get in return? Repeat customers, valuable data on your shopping habits, and the ability to apply analytics to shopping trends and other user data. 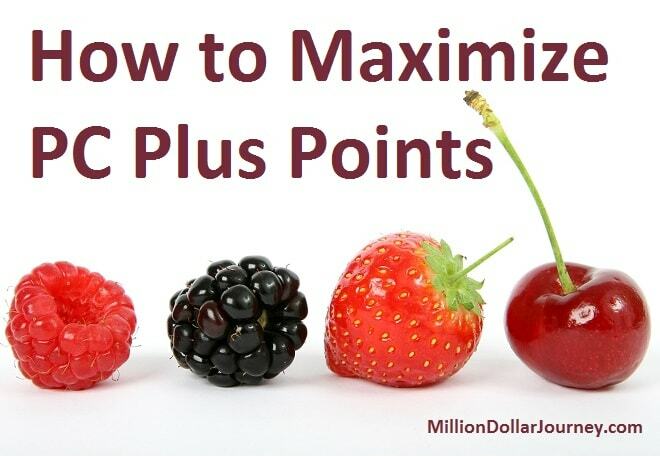 The PC Plus program may seem like it’s more “onesies and twosies”; however the points really do accumulate fast. Using this program since it was introduced in 2013, we have redeemed over $1,000 worth of groceries. We are essentially getting paid for stuff that we are going to buy anyways. Here are the main strategies that we use. The best offer, in my opinion, is for bonus points for certain spending levels. For example, last week I had an offer for 10,000 points for every $100 spent in-store. For a family of four, I will admit that it’s pretty easy to hit $100/week at Loblaws (or affiliated brand). Not only do you get the points for reaching the threshold spending, you still accumulate points for other items on your offer list. So in addition to collecting 10,000 pts for spending $100, you still get points for potatoes and Joe Fresh apparel as described above. Stacking points like this can easily result in a 20,000 + pt visit. What gets me excited (I know it’s sad) is when I get a juicy offer an on an item that I’m going to buy anyways, and it’s also on sale! For example, we often get an offer for 2,500 pts ($2.50 value) on boxed PC wings. The regular price is around $15/box which I think is too much for 1 kg of wings, so I typically pass on the offer. However, the last time we bought PC wings they were on sale for $10/box. Combined with the offer resulted in a net price of $7.50/box which gave me a sense of satisfaction. I write a lot about cash back credit cards and for the people who do a lot of shopping in Loblaws or affiliated stores, it’s hard to beat the PC Financial World Elite Mastercard. This card gives you 3% cash back on purchases you make in Loblaws stores and has $0 annual fee. So say on a good offer week, you accumulate 20,000 ($20 in value) in PC points after spending $100 (as per the example above). If you use the PCF World Elite card, you would get an extra 3,000 points ($3) which adds up week after week over the year. You can read my full review here. Since we do most of our grocery shopping at Loblaws brands (besides Costco where we are trying to cut back), my wife signed up for the PCF World Elite Mastercard a little back when there was a $100 gift card promotion. In fact, as of today, RateSupermarket is offering another $100 bonus for this free Mastercard (not sure how long the promo will last). When we first joined the PC Plus program, we joined under my name. However, when Mrs. FT signed up for the PCF World Elite Mastercard, she also signed up for her own PC Plus account. At first, I was trying to figure out a way to combine our PC Plus accounts for convenience sake. However, my procrastination benefited me in that I noticed that the offers were quite different for both accounts. Some weeks my PC Plus offers had more value, and other weeks my wife’s account would have better offers. For example, that week that I got an offer for 10,000 pts for every $100 spent, Mrs. FT’s email had an offer for 10,000 for every $125 spent. Guess which account we picked? I figured that with our pattern of shopping the offers for both accounts would be the same, but the offers come in slightly different every week. There you have it, my three methods of maximizing the PC Plus program. Essentially, follow the offers and watch them closely. I like using the PC Plus app while I walk around the store to focus my spending. The PC Financial World Elite Mastercard is a great free credit card and our goto when shopping at Loblaws and affiliated stores – we really find it contributes significantly to our points balance. Third, we stumbled upon a trick of using two PC Plus accounts instead of combining them (one per spouse) and choosing which account depending on the offers that week. Are you a PC Plus fan? Do you have any tips to share? Thanks for the article! A question: Do you have to manually load offers via the app or what have you for PC Plus to be effective? With Optimum, you have the option to load offers but if you don’t you still get Optimum points on every purchase. Is this the case for PC Pus? Jim, you’ll get a weekly email that says to click a button to “load offers”, but essentially your offers are preloaded. The app will show all your new offers on a weekly basis, which are automatically added to your account. I wonder what they’re going to do when they merge. I’ve been burned on optimum before by seeing the offer and forgetting to load it to the card. I had a free box of chocolates offer last week, forgot to load it, bought a bunch of stuff and didn’t notice I paid for the chocolates until I gave the box to my wife. I don’t think the chocolates were worth the $20 I was charged. Ah thanks, that’s what I’ve been told by other sources ie for PC unless you click on a link or load the app, you will NOT get any offers loaded, and never accumulate any PC Points. I like saving money, but I prefer the Optimum no click required model. The PC Plus/Points program has been my primary reward program for years. I think I started early 2000’s when I got 490K points for switching my mortgage to PC Financial. I was a bit disappointed when PC got rid of their financial division as we are loosing some earnings from the automatic bill payments. We maximize our points by paying for everything on the PC MasterCard. Automated bills, kids days care… anything to pay we use that card. Now that Costco uses MasterCard we use it there as well. We always pay off the card, never carry a balance so it works for us. I think my wife and I average over $1000 a year in earnings. We also use PC Home/Car insurance for the extra points. Been thinking of switching to their mobile phone plan if a good deal presents itself and my wife works near a Loblaws with a Gas Bar so she fill’s up one of the cars there. I used to use PetroCan for gas but going to switch to Esso for the extra points as well. I’ve used the points for Christmas shopping some years (game consoles, electronics, toys) to paying for our holiday feast. It may not be the best rewards program but it’s easy and we always need groceries. Wow good on you for focusing your spending to maximize points. Looks like you are getting full value out of the program. One tip I would like to add is that you can save up to 5 offers at a time for the next week using the app (and again the following week if required). This means if I get a good offer on a product I know I will buy and there isn’t a matching sale, such as 20% off chicken, I will forward that offer to the next week waiting for a better deal. Stephen, I had no idea you could do that, thanks for sharing. That tip will come in handy. Note to readers, to save an offer, you swipe to the left on the offer in your app. FT: Small comment, but I think you are double counting your savings. You mentioned that you’ve gotten over $1000 cash back (in essence) since 2013, then you mention that with the points on the chicken wings, you reduced the price from 10 to 7.50. I think you can only consider one of those to be true. Thinking that you got the wings for 2.50 extra off, and you got cash back is really double counting the points. I’ve done it before too. Some cereal boxes have a mail in rebate for a $5 prepaid credit card when you buy two boxes. I’m like ‘great, the cereal’s on sale for $4.50 anyways, plus the $5 GC means they’re only $2 a box!’. Then when I get the prepaid credit card, I’m like ‘great, free $5!’. Which isn’t true, only one of those statements can be true. We use the PC Plus points system but don’t plan groceries and don’t look at the weekly deals. Strangely all the things that have points bonus (20% back) are things we normally buy (like tomatoes, break, eggs, bananas, etc). Maybe this happened by not biting on their non-commodity specials? I use my card 100% of the time and do 80% of the groceries. My wife probably uses hers 50% of the time for the remaining groceries. We get maybe $150 back a year, if that. But it doesn’t cost anything and I’m convinced that Superstore is cheaper than Costco (and not related to Walmart). Stephen – didn’t know you could hold over 5 deals a week. Interesting info. I agree with Nobleea. I think this is a marketing tactic designed to separate you from your money. You did not get the wings for $7.50. You paid $10 and got $2.50 cash back. What you do with the $2.50 cash back determines how much you paid for the wings. Think of it in terms of accounting or budgeting. Say you have a strict food budget of $7.50 and you want to buy those $10 wings. If you say you ‘essentially’ paid $7.50 but physically paid $10 then your budget is negative $2.50. When you get your cash back you have to apply it to the budget to balance it out. I think most people will use the cash back towards a treat for themselves. I’ve been using the PC MasterCard and PC Points for years. Since the app came out I’ve accumulated $2,550 worth of points (I can only imagine how many points I’ve accumulated in total). Both my husband and I use the same card and for just about every purchase. We use our points around the holidays to buy gift cards, or to buy gift cards for ourselves (i.e. LCBO cards to stock up our bar). This was a great trick until they changed the policy where you have to now make a product purchase when you buy gift cards using points and the value of the products must be greater than the gift cards value. At the end of the day, we still use points to buy gift cards when we do our regular groceries at the store – it’s all savings one way or another. And we’ve always raved about this rewards program being the best out there. Who could disagree when we redeem on average a minimum $20 a week worth of points simply for using the card to make our normal purchases. 2500 is a huge amount in savings . Great tip about the gift cards – perfect for this Xmas season ! Curious what province you are in, Kasey? In Alberta and NS (where my parents are) we can no longer redeem for gift cards at SS ? Do you and your wife go shopping at the same time? Rather than picking which card to use based on which one has better offers that week, why not each take a cart and each put your own offers in your own cart. You can easily take advantage of the best deals from both cards without any extra work. You can always stack one cart with non-deal items to hit the $100/$125 minimum if that offer is available, or even capitalize on both if you are collectively buying $225+ in that trip. You only need one extra cart coin, and to each check out with your own PC Points card. Good tips Jeff. One thing to keep in mind as well is if you have a 10000 pts for spending $100 , it’s for every $100. So if you spend $200 you get 20000 pts . But good idea about separating the purchases. Great post! My husband would be too lazy to load offers if he got a separate email though. Or he would delete it right away since its “junky”. I wonder how they figure out the algorithm of different offers for the PC Points card. I love my PC financial MasterCard. We’ve gotten about $400 cash back in free groceries since we got it earlier this year. Thanks to you, I did sign up for the PC MasterCard and I got $150 in dining card during your last post. I also got the $20 in PC bonus signup. Whenever I do my groceries at any loblaws owned companies, I save at least 5% in combination of (MasterCard points, app offers and spending amount bonus points.). This MasterCard and app combination beats any grocery offers out there. Yes that 150 deal was the best I’ve seen! Glad that you are putting it to good use . I have found the PC Mastercard to be one of the better (maybe best) grocery store credit cards out there by a mile. So far this year, we have been able to accumulate at least $600 in points. And, thanks to Stephen above, I now know how to postpone great offers into the future as well – sweet! -price match. Sometimes I’ll receive offers that are on sale at other stores. Eg: 600 pts for leaf lettuce. Superstore has it 1.49 but freshco has it 0.79. That’s only $0.19 after points. If this happens with canned goods, buy lots and donate some. -watch for instore offers, especially on new products. I found a new type of bread that was 2.99 (pricey), but it came with 1500 points. Sometimes you might even have an offer which will give you even more points. -I get a new phone every 2 years but wait until their mobile shop has points offers. Sometimes they’ll give you up to 200,000 points just for upgrading to a free phone with a contract. Repeat, they give you $200 in points for a phone that is absolutely free. Mind blown. -New sales start on Thursdays. Your offers end on Thursday at midnight. Always go shopping for your offers one last time on thursday and save the offers you like but didn’t use within the 2 weeks of sales. Maybe that product will go on sale the following week. Repeat until offer can’t be saved anymore. This will probably change on February 1. -Keep an eye open for double or even triple offers. Sometimes I’ll get an offer 200 pts/$1 on old spice, 2000 pts/$10 in health and beauty, and 3000 pts/$30 spent in store. $30 worth of old spice products sets me up for the next 6 months and gives me back 15000 points ($15). I don’t love the PC Points algorithm; they need to make it smarter. For example, if I buy diapers I’ll get an offer the next week on diapers. I hope they don’t think I went through a box of diapers in a week! A truly smart algorithm would figure out the average usage rate for diapers, and give me that offer in a month when the data shows I should be getting low. Really, PC Points hasn’t been all that good to me (and I use it every time). My main source of points comes from gas. Another tip I received over email was to delete offers that you never use. The algorithm will improve over time to show offers that you will more likely use. “Make sure each week you delete any of your PC offers that you know you will never buy. Over a few months this will ensure the large majority of your offers will be for items you use on a regular basis. If you volunteer to participate in a PC plus vip panel and do a 10-15 min. survey you can get bonus points. I once got 100,000 extra points but it’s usually 800. A little time consuming but no junk mail. 1. If you are over 55 years of age, and your local PC (like my Zehr’s) offers the 10% discount on Wednesdays, you can get more for the same amount of money. Combined with a nice Points special, you can get a great deal. 2. Once in a while, maybe once a year, PC offers a bonus to encourage people to redeem their points. You can get points just for redeeming. This offer is very rare, and you have to watch for it. Great article. I have been using the PC plus program for years and also have a PC World Elite MasterCard. I use my card for all the purchases I can and pay the balance in full each month. Every week, I check for my offers and use those that I need. I also buy all of my gas at Superstore gas stations. I know that they are gathering data on my shopping habits, but so do many other retailers, and at least PC is paying me for it. I redeem my points as soon as I get enough to use, usually when I have $20 or $30 available. As soon as I redeem the points, I transfer that amount of money into a separate savings account so that I can monitor with accuracy how much this program is really saving me. For 2017 it was close to $1,000, which I think is significant. I plan on retiring in the next 5 – 7 years, and am saving that money for a really good retirement vacation. One more tip to add. I recently got an email telling me that if I buy gift cards at Superstore for a select number of retailers that I will receive 10X the PC points for the gift card purchases. One of the retailers is Petsmart, and since I have a dog and shop there anyway, I will go and buy myself a Petsmart gift card, get the extra points, then use the gift card for my next few purchases at Petsmart. Sorry to go counter to those in praise for PC Points, but ever since the PC people started to mess around with their system in preparation for this merge, PC Points has been quite disappointing for my wife and I. We’ve had a PC Financial account (and card) for many years, every since we were drawn in by an offer of 4% interest in their savings account. We used to get points no matter how much we spent — very slowly — no matter what credit card was used for payment at the cash register. (We maintain the PC accounts because they tie directly into our CIBC bank account so we can easily transfer funds in and out of the chequing account while still making a bit or money on interest for the balance.) However a year or so ago the grocery stores’ POP registers would accept and acknowledge the points card, but not add any points for the purchase. Our amount stalled at about $10 for months, until we made inquiries in person and by phone, and were eventually able to combine my wife’s and my points and meet the minimum $20 required for their use, which we did immediately. However the new Points Plus card has been stalled at $2 for weeks, no matter how many groceries we buy at Loblaws or their economy outlet (Real Canadian Superstore). With the new program, you will be able to redeem at $10 instead of $20. I also use pc points, and was reevaluating my credit card choices recently. Looking at the pc elite mc product, which gives you essentially 3% cash back on any purchases from their empire, versus the 1% from just having a regular old pc plus membership (no credit card). But, since I am getting 4% cash back on a major bank visa on gas and groceries, I’m ahead of the 3% from the pcf mc, plus I still get the 1% from the regular pc plus membership. So even with an annual fee I still think I’m getting more back per year. Depending on your spending per yr (family or not etc), the marginal 2% difference with no additional effort (use the pc app etc) will likely earn more than the annual fee. Or get the annual fee waived by your bank branch when you tell them you are switching to a product that offers a no fee first year on a new card. Graham, if you do your grocery shopping at a variety of stores, then I would stick with your Scotia momentum visa. It’s a great card for families with heavy grocery/gas expenses. In Alberta, we get 70 pts/dollar spent at Superstore gas stations, and with the price of gas just over $1.00/L right now, the return is close to 7%. If you have a PC world elite mastercard, I think you also get an invite to join the PC Insiders Club, which is a bit like Amazon Prime for Loblaw stores. For $99 per year, you get free click and collect, 20% points back on certain categories like diapers and organics, joe fresh clothes, and a $99 credit that can be used for PC Travel. No weekly pc points were sent to upload for this present week, ending today, Feb.14. I missed not having them sent out on my email! What will happen, if you buy something, because you will get, let say 20x bonus points. But after one week, you go and return the item. Would they let you keep the bonus points or they load the points after a month (just to make sure the bonus item has not been returned). Help required to understand this better. Yes, we love the 10% and sometimes even 20% pts back on ENTIRE grocery bills. I say get sepearate PC points card accounts for each spouse to maximize the chances of offers. As a result, we achieve over $1000/yr from PC points. Once nice thing with the new PC Optimum plans is you can create a Household where you link all PC Optimum points accounts together so all points are added together and ANYONE in the Household account can have access to everyone’s points. If you separate the accounts later, everything is proportioned out. Simplifies usage of points.